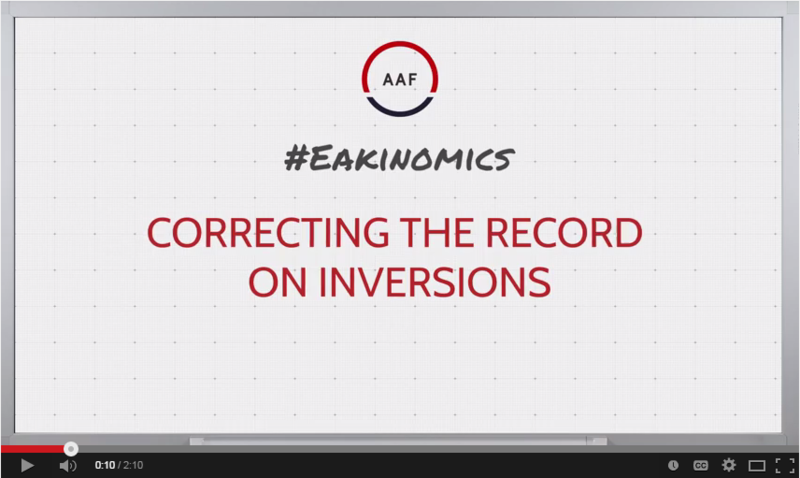 The facts regarding inversions are the subject of a new #Eakinomics video released today by the American Action Forum (@AAF). AAF President Douglas Holtz-Eakin provides a straightforward rebuttal to recent comments made by critics, including President Obama, claiming that inverted companies unfairly take advantage of the education system and infrastructure without paying taxes. In the video, Holtz-Eakin explains that inversions level the playing field while companies continue to pay taxes after the practice. “A foreign subsidiary operating in the United States takes advantage of the university system, the infrastructure, the research and other public benefits and in exchange pays U.S. tax on its U.S. earnings. A U.S. subsidiary operating in a foreign country takes advantage of their university system, their infrastructure, their research and public benefits, and in exchange it pays foreign tax on the overseas earnings. But a U.S. firm does take advantage of the university system, the infrastructure, the research and other public benefits, and it pays tax on its U.S. earnings plus an extra tax on its overseas earnings. So, it pays more for the same thing. And, when it inverts it levels the playing field, paying U.S. tax on U.S. earnings for access to university system, infrastructure and basic research. Is that really unfair?,” says Holtz-Eakin in the video. Click here to view the #Eakinomics video.